Working while sleep deprived is a drain on everybody involved. For the exhausted employee, it can turn even the most enjoyable work into pure drudgery. For the employer, the situation spells loss of productivity. Sleep apnea and snoring are a common cause of daily fatigue, and afflicted workers risk not only their safety but also their job security if they go untreated. 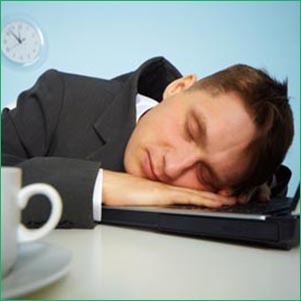 Even the most dedicated employee is unlikely to be a match for the daily exhaustion caused by sleep apnea. Many employees are tired by the time they leave work for the day, but sleep apnea sufferers are already exhausted when they arrive. Attending to simple work duties is a strain, and the urge to fall asleep can be consuming. Employers are bound to notice this loss of job performance and may wonder if the tired employee isn’t managing his or her home life properly. Co-workers are also affected, being forced to cover more work neglected by the sleep apnea sufferer and having to deal with their bad mood. Finally, fatigued workers also present safety risks to themselves and others if they drive or handle heavy machinery at work. In the end, these problems may force the sleep deprived employee out of a job. The work problems caused by sleep apnea can be solved with timely treatment. Before the risk of job loss presents itself, sufferers should seek treatment to eliminate the cause. Sleep apnea can arise late in life, leading some to mistakenly believe that their loss of abilities is from aging rather than a sleep disorder. A sleep study can identify the problem so that employees can seek treatment and regain their ability to excel and stay financially secure. Getting a diagnosis is the first step towards reclaiming the ability to make a living. After making a diagnosis, Dr. Ana Brightleaf will discuss treatment options with you. This can range from lifestyle changes for mild sleep apnea to clinical treatments for moderate or severe cases. In the latter case, this may include CPAP or newer, more easily tolerated treatments, such as oral appliances and soft tissue removal. Find your way back to healthy sleep, come in for a complimentary consultation.